I don't often talk about the goings-on in my garden, largely because I think that there are many bloggers who are much better informed than I am on matters horticultural. However, I can't resist a short digression on the very curious soft fruit known as the pineberry. Just a few short years ago articles started appearing on gardening sites about strange berries that looked like white strawberries with red seeds and that tasted a bit like pineapple. They were frequently believed to be April Fool jokes. The wildly different opinions on how good they tasted didn’t help. Some said they tasted of nothing at all, while others said that they were the best berries that they’d ever eaten. Last year I got hold of a few plants and grew some for myself and, for what it’s worth, here are my very unscientific and highly personal conclusions. They can be treated like any strawberry plant but they seem to be more sensitive to the cold and wet. So keep them sheltered in the winter, unless you have very forgiving winters where you live. A greenhouse is probably best during the coldest weather. They aren’t likely to produce a massive crop (although the weather wasn't great this year and that may well be a factor). And now the important bit – the taste. On the scale between ‘tastes of nothing’ and ‘best berry ever’ I’m definitely leaning towards the latter. I would probably still prefer a really good wild strawberry but pineberries combine a wild strawberry taste with a sharper edge that is genuinely reminiscent of pineapple. They probably won’t change your life, but, if you have a spare pot or two in a warm spot, they are definitely worth trying to grow. Although I’ve never seen them in the shops, I’m told that pineberries are sometimes sold in limited quantities in supermarkets and upmarket (or, to put it another way, expensive) grocers. Digression over - I promise to get back to recipes shortly. This is a really well known traditional cake that you’ve probably seen many times before in books and blogs but I can’t resist bringing you my own version. It’s such a useful and versatile little treat. There are many variations around, including some which are more like a classic almond tart and some which are closer to the sort of substantial cake served with afternoon tea. For my first attempts at baking this cake many, many years ago I used a recipe that included butter and very pleasant it was too. Then someone from Spain told me that I should try it without the butter and that’s the way I prefer to make it now. This version is light, moist, simple, flourless and, admittedly, a little fragile. Although you can serve it very successfully with tea or coffee, this cake comes into its own as an excellent and easy dessert at any time of the year and after pretty much any sort of main course. You can serve it with cream, custard, yogurt or ice cream. You can also serve it with either fresh fruit or, even better I think, a seasonal fruit compote. Apricots poached in syrup with a dash or three of amaretto work especially well. I've even known some people to serve it alongside young, fresh-tasting cheeses. Traditionally, the cake should be sprinkled generously with icing sugar while a template is laid across the top in the shape of the St James cross. It’s a lovely tradition but I never use the template since it implies to me that I know what I'm doing and that I’ve made a genuine and authentic Tarta de Santiago. I’d never claim that. You can use orange instead of lemon zest or a combination of both if you’d prefer. If I was being authentic I'd add cinnamon to the mix, but I prefer it without. Carefully butter and line the base of a 20 cm cake tin. A springform tin is probably easiest – it doesn’t need to be very deep. Preheat the oven to 170°C. Whisk the egg yolks and sugar together thoroughly. They should be very light in colour by the time you’ve finished. Sift the ground almonds to get rid of any lumps and stir them into the egg yolks. Then stir in the zest and almond extract. (The mixture will be quite firm at this stage). Whisk the egg whites to the stiff peak stage. Stir a few spoonfuls of the egg whites into the almond and egg mixture to loosen it and then fold in the rest. Put the mixture into the prepared tin, level the top and bake in the oven for 30 – 35 minutes. Test with a skewer or the point of a knife. The skewer should come out clean but ideally the inside of the cake should remain moist and just a little squidgy. If the cake seems to be darkening too quickly during cooking, cover it loosely with foil after 15 minutes or so. Allow the cake to cool a little in the tin before removing carefully to a cooling rack. Once cold, dust the cake generously with icing sugar (with or without a template in place). ‘T’ is the chosen letter in this month’s AlphaBakes challenge hosted by Ros from The More Than Occasional Baker (the host for this month’s challenge) and Caroline from Caroline Makes. So I'm submitting the Tarta as my entry. 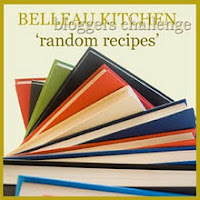 For this month’s Random Recipe challenge hosted as usual by Dom at Belleau Kitchen I’m going back to the 1980s for a dessert that’s strictly for grown-ups. It’s a remarkably simple and quick ice cream that doesn’t need an ice cream machine and that stays soft enough to be eaten straight from the freezer. From one of my less-used shelves I randomly picked a slim volume called ‘The London Restaurant Recipe Book’ published in 1983, which features a number of the best-known restaurants of that time. It’s like a window onto a lost age. Alistair Little was still at 192, Stephen Bull was at Lichfield’s, Pierre Koffman was at La Tante Claire and David Bowie had just released ‘Let’s Dance’. French fine cuisine was still the predominant style, although I rather doubt the Frenchness of some of the recipes in this book. The random page took me to recipes by Patrick Gwynn-Jones of Pomegranates. Mr Gwynn-Jones opened this basement restaurant in Pimlico back in 1974 and it finally closed its doors for good in 2009 shortly after he retired. In all that time the menu remained varied and eclectic but the 1970s décor was never updated. It was said to be the haunt of celebrities and politicians and was reputed to be the ideal place for a discreet assignation. I really can’t vouch for that – I've always been a good boy. The recipe on the random page is one for ‘Honey and Cognac Ice Cream’. I have to admit that I couldn’t quite afford a good cognac and so that’s why I've called it ‘Honey and Brandy Ice Cream’. I've no reason to doubt that this dish originated in the Pimlico kitchen (essentially it’s a simplified iced parfait recipe) but, in one form or another, it became something of a 1980s classic. It seemed to turn up in many, many different restaurants. For instance, Franco Taruschio made something akin to it at The Walnut Tree and Gary Rhodes used whisky to make a similar dessert. But, although I'd eaten it, I’d never made it, so I think that’s OK for the rules of Random Recipe. I confess to reducing the quantity and adjusting the ratio of ingredients a little, simply because the recipe seemed to work better for me that way. This ice cream is very reminiscent of the 1980s in some ways – indulgent, slightly over the top and very boozy. It’s truly delicious and even those who don’t like brandy often seem to love it. But, a bit like a 12 inch single by The Human League, I wouldn’t advise too much of it in one go. This amount should serve eight comfortably unless you have a truly 1980s appetite. The recipe is also open to many variations – I have very fond memories of a heather honey and lowland malt whisky version many years ago. Whisk the egg whites until stiff. Gradually add the icing sugar while continuing to whisk until the mixture is very stiff and glossy. Beat the egg yolks until pale and thickened. Whisk in the brandy and honey. (Make sure that the honey isn’t too cold or this could prove a little tricky). Whip the cream lightly until it stands in soft peaks. Mix the whites, yolks and cream together, lightly but thoroughly. Pour into a container, seal and place in the freezer. The original recipe recommends removing the ice cream from the freezer after 2 or 3 hours and remixing it. This isn’t strictly necessary, but it does ensure that the mixture remains even as it freezes and avoids any danger of the cream separating into lumps. Mr Gwynn-Jones suggests serving this with Langue de Chat and I certainly can’t argue with that. On the other hand, I’d gladly eat it straight out of the freezer container, with or without a spoon. You may have noticed that London is hosting the 2012 Olympics. I have the greatest respect for Olympians and sports people everywhere but sport tends to baffle and bemuse me in a similar way to calculus. I accept that it’s my loss. The only real exception for me is cricket and even then I only enjoy the game when nothing much is happening. On the other hand, since the Olympic Cycling Time Trials took place in Surrey and actually passed by about a 1 minute walk from my front door, I would have to be a serious curmudgeon not to take a look. Well, I may be a curmudgeon but I’m rarely serious. I reckoned that I’d need sustenance to keep me going throughout the event. As I understood it (which is not very well), the cyclists in the time trial would set off at 90 second intervals, so I’d have to make something that I could eat in less than 90 seconds. That seemed to call for biscuits. Of course, it had to be British biscuits for patriotic reasons and so I baked some very traditional Devon flats. I’m not sure that the Time Trials turned me into a cycling fan but there was a relaxed party atmosphere among the spectators and everyone seemed to have a great time. The biscuit plan, however, didn’t quite work. I made them too far in advance and they’d been eaten by the time of the event. This is a very old recipe and I don’t think I’ve mucked about with it too much, although I do add a little baking powder which some traditionalists might consider a heresy. This will make around 24 biscuits, although that will depend on how thin you want to make them. Sieve the flour and baking powder together and stir in the sugar. Pour in the cream and the egg. Mix the whole lot together either with a wooden spoon or using a mixer on low speed. You want to end up with a soft but not sloppy dough and there's a chance that, once the ingredients are thoroughly combined, you will have a dough that’s a little too stiff. Add a teaspoon or two of milk to soften the dough if it needs it, but don’t overdo it. Cover the dough and put in the fridge for 30 minutes or so. This stage is not essential but it’s a good idea to chill the dough to make it easier to handle. If there’s anything at all tricky in this recipe, then it’s rolling out the rather sticky dough. Preheat the oven to 190°C. Roll the dough out thinly on a floured board and cut out the biscuits using a 7 cm round cutter. Place on greased or lined baking sheets and sprinkle lightly with a little extra caster sugar. Bake in the preheated oven for around 10 minutes until the biscuits are golden brown on top. Cool the biscuits on a wire rack and store in an airtight container once cold. Actually, I must confess that I also have a certain fascination with the Olympic Human Don’t Be Angry finals but I can’t seem to find them in the TV guide. The Best of British blogging challenge, which is sponsored by New World Appliances, has been running for a few months but I haven’t managed to enter before now. This month it features the beautiful county of Yorkshire and I can’t resist that. The details of the challenge can be found on The Face of New World Appliances and this month it’s hosted by Karen from Lavender & Lovage. Now Yorkshire could mean rhubarb, Yorkshire pudding, Old Peculier, curd tart or a slice of fruit cake with a piece of Wensleydale cheese amongst many other fine things. On the other hand, you might not immediately associate gooseberries with Yorkshire. In fact, there’s a long and very proud tradition of growing gooseberries in that county. The finest symbol of that tradition is the Egton Bridge Gooseberry Show, which is now over 200 years old and can boast that one of its competitors broke the world record for the heaviest gooseberry back in 2009 with a 62 g berry. This recipe doesn’t require world record sized berries. It’s a very old-fashioned pudding that’s based, albeit loosely, on an Eliza Acton recipe from 1845. Actually, in some form or other, the dish is probably a fair bit older than that. It’s not the most attractive looking pudding but it is seriously full of flavour. This should serve four unless you have the appetite of a particularly aggressive fast bowler from Yorkshire. Wash the gooseberries and place in a saucepan with a small splash of water, cover and place on a gentle heat. Cook the gooseberries, stirring regularly, until they fall apart. Work the gooseberry pulp through a fine sieve while still warm. Stir in the lemon juice and vanilla. Add the sugar and stir until it dissolves and then do the same with the butter. If the gooseberry mixture has cooled too much to allow the sugar to dissolve and the butter to melt, than put it back briefly onto a low heat. Once everything is thoroughly combined, set the mixture aside to cool completely. Whiz the amaretti biscuits in a processor or bash them in a plastic bag until they’re reduced to quite fine crumbs - although a little variable texture is no bad thing. Whisk the eggs until they’re pale and frothy. Preheat the oven to 180 °C. Stir the crushed amaretti and the whisked egg into the cold gooseberry mixture until thoroughly combined. Pour the mixture into an ovenproof dish (something around 18 cm x 12 cm will do nicely) and bake in the oven for around 30 minutes until the top is a deep golden brown but the pudding still feels a little squidgy to the touch. You can serve this pudding warm or at room temperature, but I prefer it well chilled and with a little or not so little cream on top.